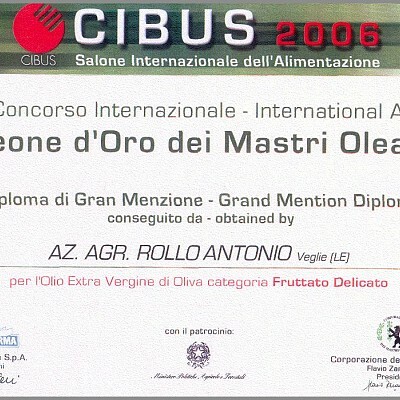 to customers who recognize and appreciate the excellent quality of a unequalled product. 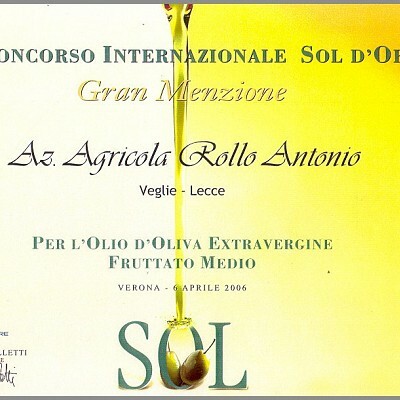 The Rollo’s Farm 1859, Historical Enterprise of Italy, represents the excellence in the olive cultivation field and it’s located in Veglie (Lecce), Salento area in South Apulia Region with about 20 hectares of oliveyards and 4,000 olive trees. 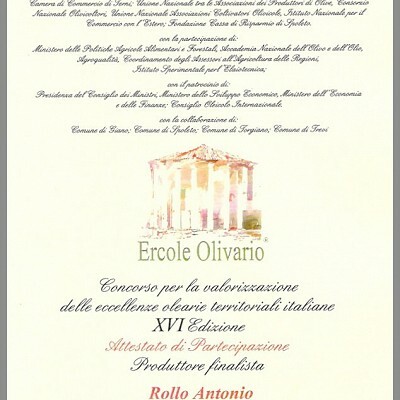 The several varieties of olives produced , from the autochthonous ‘’ogliarola di Lecce’’ and ‘’cellina di Nardò’’ to ‘’leccino’’, ‘’frantoio’’, ‘’nociara’’, ‘’nocellara del Belice’’ and ‘’biancolilla’’ confer on the blend of our olive oil a unique smell and taste. 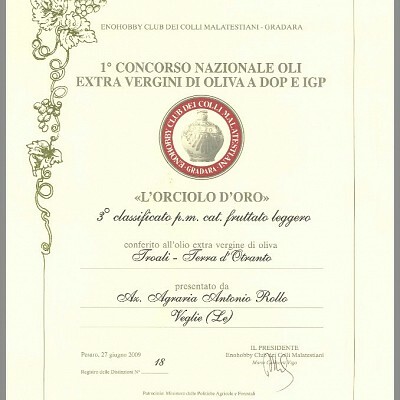 Our Farm has received several awards in the most prestigious exhibitions of the sector as ‘’SOL di Verona’’, ‘’CIBUS di Parma’’, ‘’Sirena d’oro di Sorrento’’, ‘’Ercole olivario di Perugia’’, ‘’Orciolo d’oro di Pesaro’’ and it produces extra virgin olive oil and extra virgin olive oil certified DOP ‘’Terra d’Otranto’’ marketed in Italy, in several Countries of European Community, in USA and Japan. 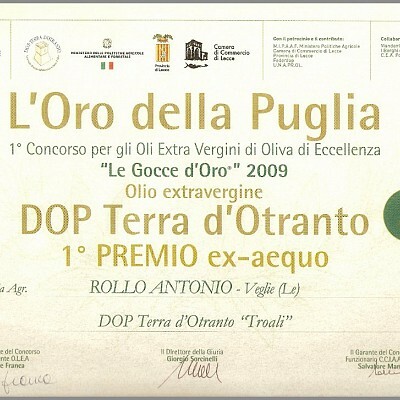 The paint showed in the label of our extra virgin olive oil DOP "TERRA d'OTRANTO" named "Troali" is a performance of the Sicilian artist Pippo Madè, a pupil of the great Guttuso, and represents the genesis of olive according to Greek mythology. 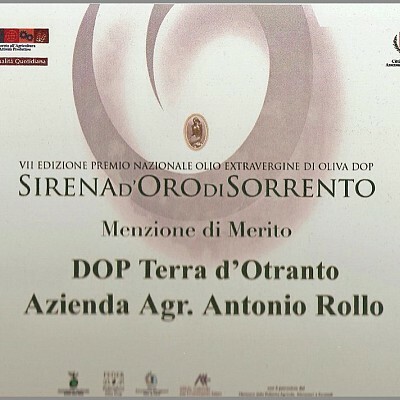 In the painting are showed the various symbols of Goddess Athena who presented the first olive of history the inhabitants of the Greek city that then took her name. 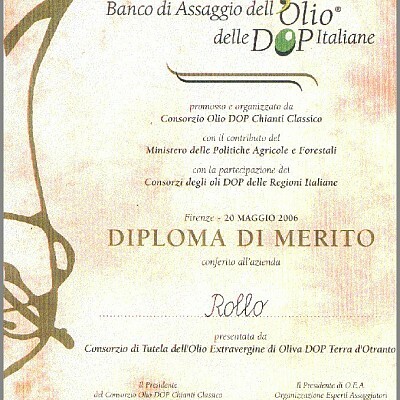 At the basis of the millenary olive, as an element of fusion of myth and reality, the ancient farm-house "Troali", a property of Rollo’s Family, which names its olive oil is showed.